China Number One Emitter! Playing the West for Suckers! China has the world on a string ,paying lip-service to green power but building coal-fired power stations at an unprecedented rate and is now the world's largest emitter of carbon dioxide. China acknowledged on Tuesday it is the world’s biggest emitter of greenhouse gases stoking global warming, confirming what scientists have said for years but defending its right to keep growing emissions. Many of the power stations are subsidised by a gullible Europe to meet carbon credit obligations. China is the source of more than half the Certified Emission Reductions or CER's used for carbon offsets!
. So to re-iterate for the intellectually-challenged among us known as politicians we are subsiding cheap coal power for the Chinese and they are selling us intermittent solar and wind power generators to produce expensive and unreliable power for ourselves. The President of Mexico , holidaying in Cancun informed his audience that 60 people have died in storms and other natural phenomena which "may" possibly be attributed to global warming. Mexican President Felipe Calderon told negotiators in Cancun today that global warming already is causing natural disasters in his nation, killing at least 60 people this year in storms and events linked to turbulent weather alone in his country . The 28000 recent drug-related murders in Mexico would seem to be a real problem where he should be concentrating his time not on an imaginary one like global warming. 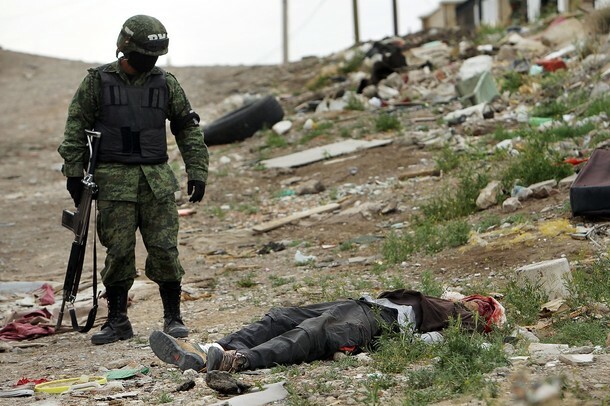 Military police stand guard at the scene of a murder on March 23, 2010 in Juarez, Mexico. Some transport operators in China are pushing hard the low carbon message showing how important balance is in the new carbon-free lifestyle. Louise Gray of the Telegraph has been naughty in flying to Cancun and creating a large carbon footprint with her airflights and hotel accommodation but it is all OK because she has confessed to her sins and paid her 22 pounds and her carbon gluttony is forgiven, She can then join the throngs of similarly cleansed ideologues in getting down to the business of stopping the great unwashed enjoying the same carbon consumption because it is so bad for the planet. King Canute ,by sitting on the beach and commanding the tide to go back demonstrated to his people the futility of trying to control Nature , a lesson today's warmists apparently have not learned. The logic in choosing Canute as a symbol for their nonsense completely escapes me. David Cameron the PM has written an article for the Guardian showing such economic naivety that I fear greatly for the survival of the Mother Country in the hands of such a complete prat! With soaring rhetoric he prepares for Cancun urging the yeomen to gird their loins against the latest enemy to assail the fair shores of Britain - global warming . Unfortunately these plucky English chaps are up to their knackers in snow in a record-setting winter so loin girding against warming is not such a high priority for them. Henry Ergas of the Australian lists the front-runners for the Dodgy Awards , a tongue-in-cheek look at the abysmal record of those governing this fair land and their policies. The solar industry is bleating because the Spanish Government has cut solar rebates to meet EU debt reduction guidelines. With Ireland under the pump, Portugal and Spain are the next financial dominos to fall unless drastic action is taken. The Spanish experience should sound a warning to other governments going down the same path. Cost-Saving State Law Endangers Growth of Wind Industry - Great ! The Illinois Power Agency is under fire for following it's mandate and purchasing wind power on the spot market and at the best price. Green advocates who want to build huge numbers of the useless turbines cannot get financing without long term contracts because no bank or financial institution would lend money on intermittent power generators selling power at multiples of the normal energy price. The NewYorkTimes shows how far the green press has become disconnected from reality in describing as "Byzantine"the process of spending taxpayer's money economically by calling tenders . Byzantine means 'convoluted, complicated or difficult"- words I would not apply to a Government following correct procedure ,calling tenders to spend millions of taxpayer's money. The ultimate in micro-regulation is what the Smart Grid represents. Someone in a remote place will be able to decide which appliances you can run and turn off the others. Home Climate Prediction With Met Office Software! Wow! The Met Office has been so consistently wrong with their predictions that they now don't make short term seasonal forecasts to prevent further embarrassment. Surprisingly they are branching out to allow online users access to their models and software but given the record of the Met I can't imagine why anyone would use such a lemon! Suzanne Rosier starts her Guardian article with the statement " Climate Change is unequivocal" and you can safely ignore anything after that because that is the claim of a zealot , not a scientist. Orwellian Doublethink is alive and well today with the latest "research" saying cold winters "may" be caused by global warming just as Europe gets set for another horrific winter and on the eve of the Cancun chatterfest designed to separate gullible politicians from their taxpayer's money. Shortly the sky will be full of carbon-spewing aircraft with their precious cargo of bureacratic fat-cats snug in their first-class cocoons, all headed to Cancun to decide how to control the lifestyle of the their less fortunate proles! The Australian has the story of the infighting over the National geography syllabus to be introduced across the country. THE proposed national geography curriculum lacks clarity and quality.NSW geographers are concerned it contains an inadequate focus on physical geography or the study of "capes and bays", which underpins the study of the discipline.The NSW Board of Studies argues the proposed curriculum will overemphasise social and economic geography at the expense of the study of the physical world. The sample structure for the course suggests students in Years 7-10 take a "cultural/social constructivist" approach. Now the un-initiated may well wonder what a "cultural/social constructivist approach" is,and view it with well-deserved suspicion. Kevin Dunn, professor of geography and urban studies at the University of Western Sydney, said yesterday the NSW curriculum was a benchmark other states should reach. "Only with the appropriate amount of mandatory hours can we expect the teaching of geography, at the depth necessary, to ensure that students have a satisfactory level of understanding of environmental sustainability, conservation, population, indigenous cultures and land management," he said. "We need citizens who understand their world, and how the world will be in the future." Professor Dunn left off the bit about citizens trained to vote for left/green candidates after studying their policy manual for years. Geography is no longer geography when it is being used to spout a political view of the world. The Guardian True to Form on Climategate Anniversary - New Emotive Picture! The Guardian's Robin McKie has at least updated the discredited "polar bear on an ice flow picture" showing great journalistic flair and originality with the latest emotive picture " walruses on an ice floe" showing how far he has moved on since Climategate. In the first part of the article McKie gives a brief description of Climategate but describes the leaks as "hacking" and uses bias with statements like "appeared to show" to set the tone for the remainder where he describes in detail how the whole affair was really nothing as various inquiries cleared the UEA of any wrongdoing - just a bit of schoolboy exuberance. Climategate Anniversary - Climate Hoax is Dying but not in Whitehall! Christopher Booker continues his trenchant criticism of the climate policies of the UK Government which continues relentlessly down a ruinous economic path as the climate hoax wanes around the world! As the Climategate birthday approaches on November 17th it is fitting to reflect how much the world owes the person or persons who leaked the data which derailed the Global Warming juggernaut! Flexible Warmist Scientists Have An Each Way Bet- Can't Lose! 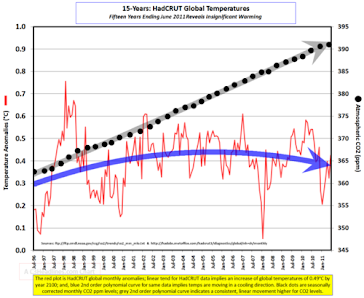 Climate modeler says models predicting global warming in the near future may be wrong and we will see 20 years of cooling before we are all toast. These models that may be wrong can't be of the "science is settled " variety otherwise the consensus of 99.99% of climate scientists would look pretty sillly which in fact they do.The chameleon Warmists always have a new model ready to meet inconvenient data changes like long-term cooling, conveniently ignoring the fact that the old models on which we were supposed to remodel the world are dust-binned to be removed by the alarmist version of Winston Smith. Whatever happens they will be able the say "the" model was right whether it cools or warms. The main stream media is slowly catching on as Tom Arup in the Age says that the solar panel subsidy scheme has been a financial disaster mainly rewarding middle class families . home in someone else's war. US Congress - Warmists Will Have Some Explaining to Do! The changing of the guard in Congress has Warmist scientists bleating already and so they should. 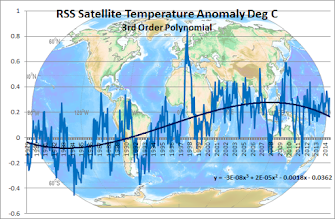 They will be asked to explain the huge discrepancies that skeptic bloggers have found and number one for me is this graph of the US NCDC temperature data set. James Delingpole reports on the UK Government's ambitious solar plans which will have farmers planting solar arrays instead of crops and reaping a 20 year bumper harvest at the expense of the long suffering taxpayer. The incentives are amazingly powerful. Under the "feed-in tariff" scheme launched in April as part of an attempt to meet EU targets on renewable energy, farmers are being offered subsidies as high as £1,500 an acre to cover their green fields with shiny, black and silver solar arrays. This means that a farmer with 35 acres to spare stands to make £52,500 a year. What's more, this has been guaranteed, tax-free, by the Government for the next 25 years. This means that children of today will be paying billions of dollars 20 years into the future for intermittent power at three times normal cost that the power grid does not really want. This is all to satisfy the ideological whims of a bunch of intellectually-challenged prats in Whitehall who can't do the simple maths to see how dopey the scheme is! Countries formally supportive are now are starting to jump off the solar band-wagon like fleas off a mangy dog , but not the true believers in the UK Coalition. I must see if I can interest them in some great Nigerian loans!